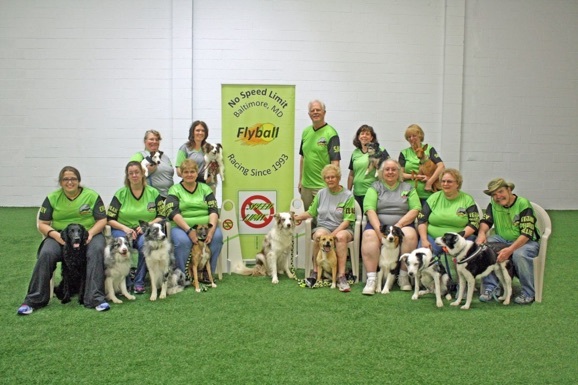 The No Speed Limit flyball team is a part of the Oriole Dog Training Club of Baltimore. Practice is held for beginning dogs on Thursday evenings at 7pm and for competing dogs at 8pm in the Oriole Training building in Helethorpe, MD. For registration information please call the phone line at (410) 298-K9K9 or email Carle Lee. of our current racing dogs. **NEW** Future Stars contains links to our flyball stars of tomorrow. Team puppies and current dogs in training are included on this page. Retired Dogs contains links to the individual webpages of dogs who have retired from racing. Rainbow Dogs contains photographs of those dogs who have passed away. The photographs on this page serve as links to their individual webpage. Flyers, seeding charts, welcome letters and racing schedules for our next tournament can be found under the Tournament Information page, as they become available. Be sure to check out the videoclips of our teams on the Videoclips page. And for some old time memories, check out the Old Team Photographs.